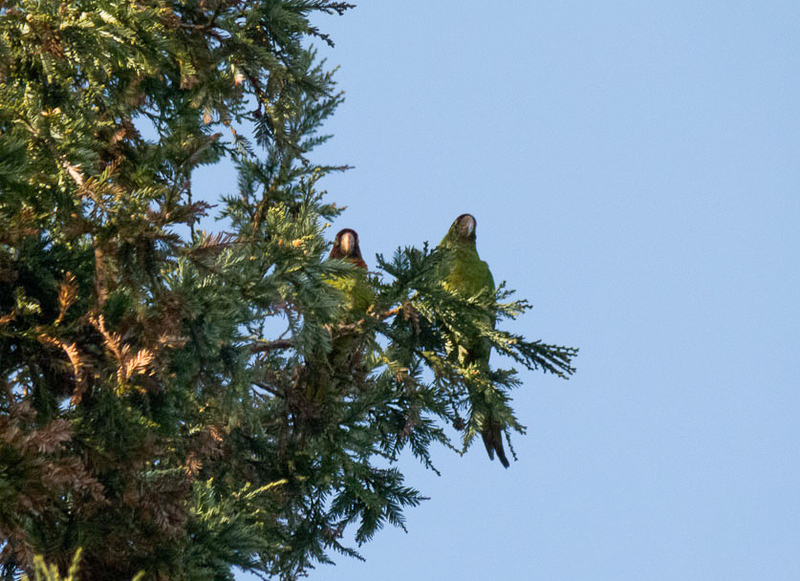 This entry was posted in Feature Articles and tagged parrots, Rick Trutna, Sunnyvale, Trutna, wild parrots by rick8041. Bookmark the permalink. Thanks for the pictures and this informative article. 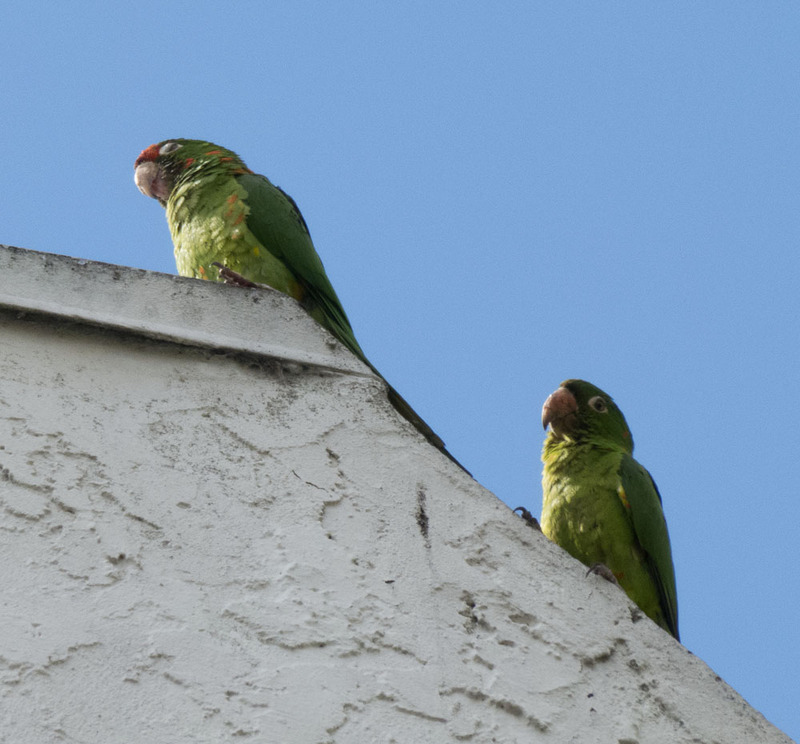 I live in Sunnyvale and have seen the parrots quite a few times. I love when I hear them and then spot a few. I think they are so interesting. 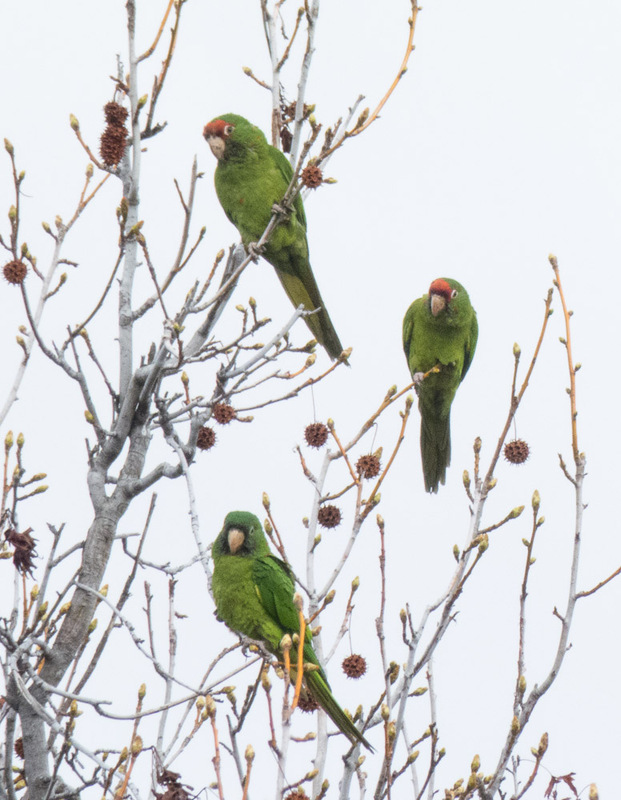 Saw them today at apartments on corner of el Camino and fair oaks ave. very loud and they were chasing the crows out of the area. Fun to watch. Where are the. Sunnyvale Parrots now ??? I haven’t heard this winter or spring. It’s 4:51 and I just heard the little guys fly by about five minutes ago! They always put a smile on my face! 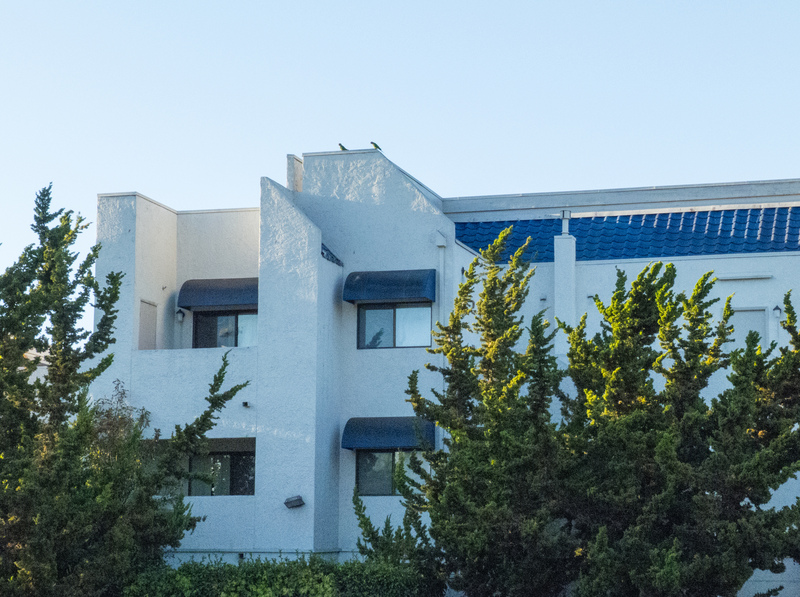 I used to work for OSH forever ago and unfortunately yes, there were complaints from the residents in the condos with the multi color awnings but I’m glad they’ve found a home in Los Palmas! That island is ideal for them to live!!! I saw them the other day in the trees by the 24-Hour Fitness. They also like the redwood trees around City Hall on Mathilda and El Camino Real. I had never looked by City Hall, but it makes sense since it’s all in close range. Thanks for posting. Hey. They are around and thriving. I have seen various groups spread out all the way from central expressway in the east to Homestead road on the west. I hear and see them all the time around the corner of Remington and Sunnyvale Saratoga road. Also by the Orchard Supply center near where Mathilda meets Sunnyvale Saratoga road. 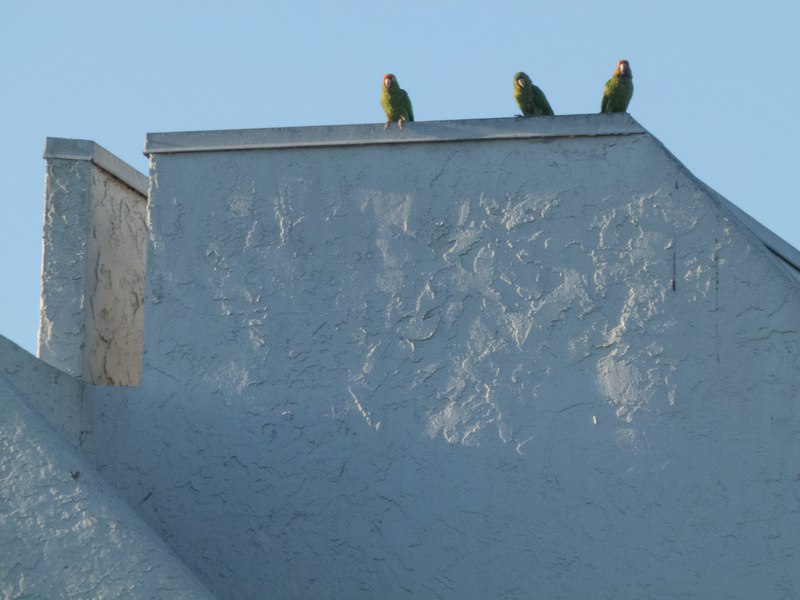 I live in Sunnyvale and have heard the parrots. My Mom lives in Orange County, I was just there a week ago. There is a flock there. Last summer I saw two in her back yard. This year there were to many to count. Her neighbors have out of control quavas which are now ripe. It was amazing to see they are loud but so beautiful! Yeah, I have seen them in the air vents. Guess, when you need to warm up, it’s probably pretty convenient. The Safeway store is pretty new, but I imagine if there’s a new food source, the parrots will take advantage. I have seen them eating the fruit and buds of trees and I have even talked to some people who say they have fed them, but I’ve never succeeded at attracting them enough to do that. Thanks for posting! I work the east side of Lawrence Expwy and El Camino. I have seen them fly over the expressway several times, most recently late November 2013. I am fascinated and a bit excited when I see them. I just spent 10 days in Sunnyvale, and my gosh..the parrots are alive and well and thriving! I counted 42 of them in a flock flying around in that area. I was surprised at how big they are! They were picking at the vents and I wondered if they were picking out lint for nests. What a fun thing to see! I am at Florence st and Iowa ave in Sunnyvale and I just saw them! I didn’t know there were feral parrots here. I love them. I saw about 5 of them this morning flying out of the trees at the Graham Middle School track in Mountain View. What a surprise! Just saw them in a tree next to Sprouts – El Camino & Sunnyvale Saratoga. Just saw these here in Cupertino next to the Apple campus! Just saw the Parrots from my patio. I have seen them here before, no mistaking them. I hear them mainly in Cupertino, Mountain View, and Sunnyvale. I am curious how they arrived here? I frequently hear and see them in the parking lot of the Sunnyvale Community Theatre. I am at El camino and Marhilda right now, and man can they squawk!..I lived at Marhilda garden apts, for many years, at the time there were cherry orchards all around! They would spend all day there!.crazy birds!! I asked about these birds as a child and my neighbor said she remembered parrots in Sunnyvale when she was a small girl. If she was still alive, she’d be 102 now. Amazing! 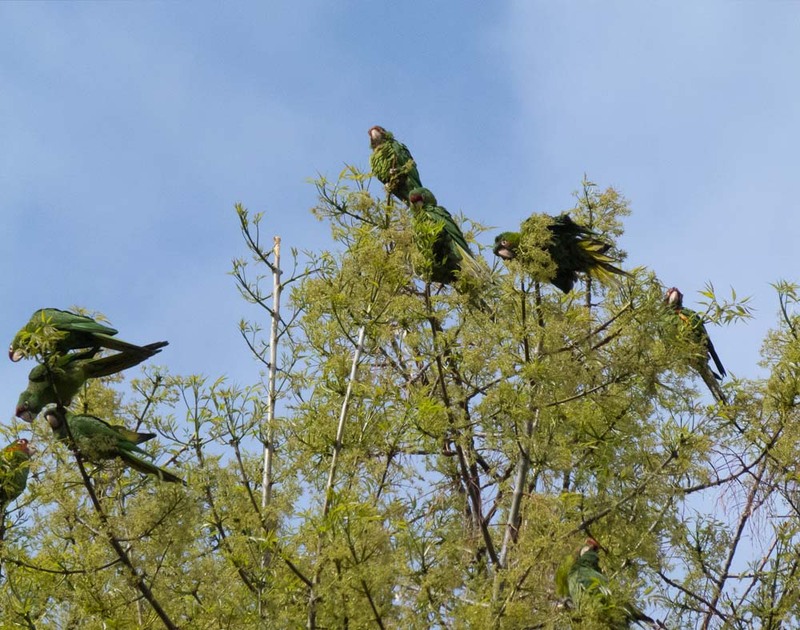 My daughter and I stopped for lunch at Boudin SF, Sunnyvale (Sunnyvale Saratoga Rd) this past weekend and couldn’t believe our eyes… 8 parrots perched in the tree right there in the parking lot! Glad I came across this site with the background info! Thanks!! Such a treat to see! I used to live in Mountain View in the early 70’s (’71-’72) on Palo Alto Ave. 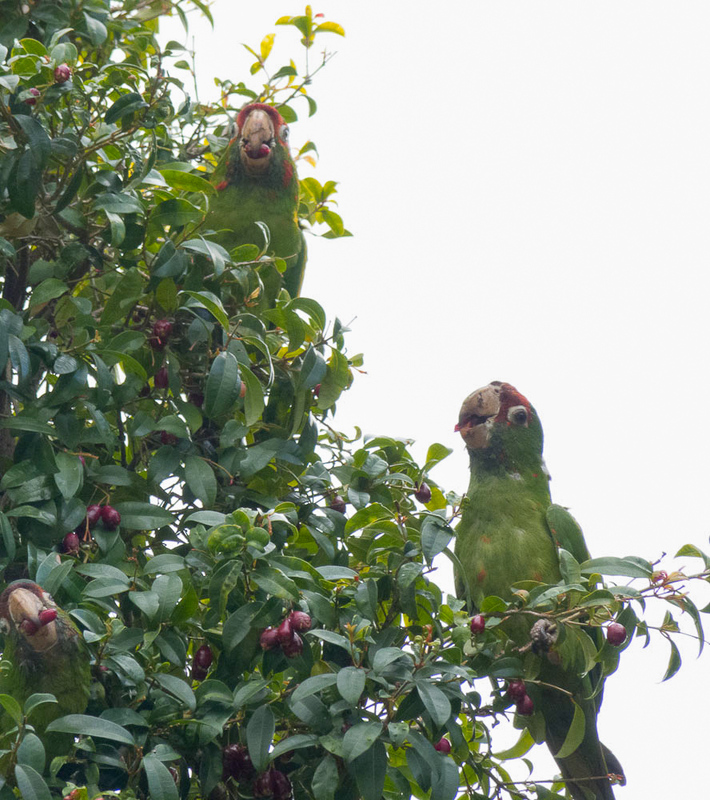 There were wild parrots there then! 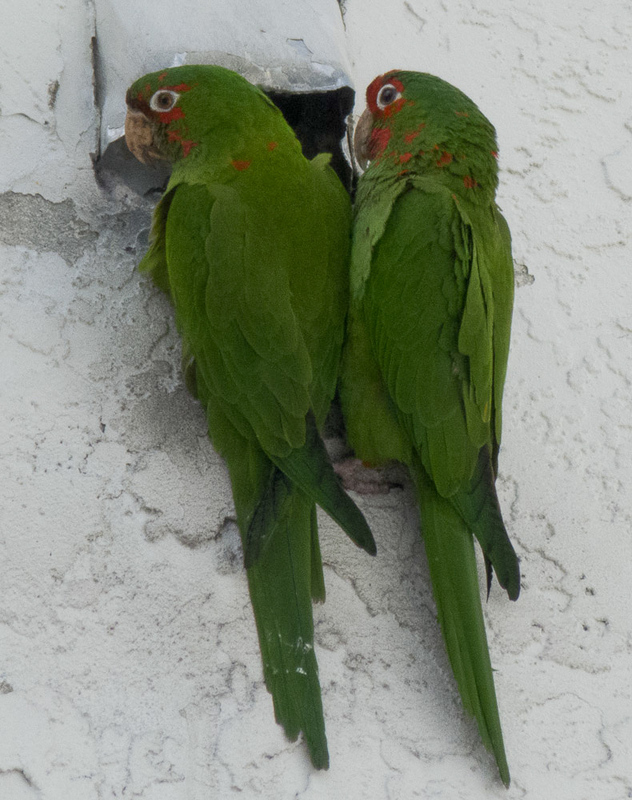 I just moved here and noticed the conures! Loved this article. Have you figured out if the roost consistently in any particular parks? 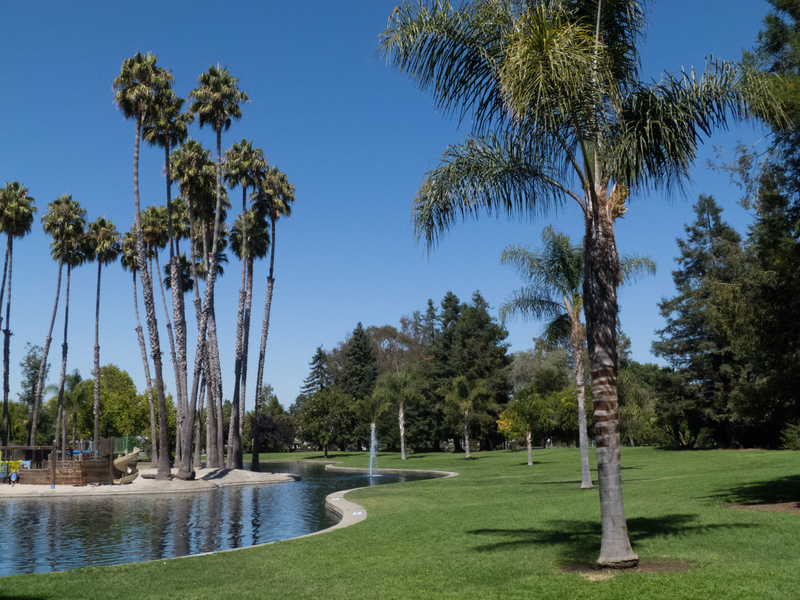 I’ve lived here for about thirteen years and they are always (okay, 99.9% of the time) at Las Palmas Park in Sunnyvale. You’ll hear them, no joke, and then you’ll see them. 😛 Hope you find them! Let me know if you do. They’re such amazing creatures.